So it's Sunday again. Unfortunately I didn't have much time for writing articles during the weekend, that's why it will be kind of "what I've been doing" article. And I have two tips for you at the end of the article. At the weekend I was (unfortunately) studying. I tried to catch up all, what I've been putting off since new year has started. My main goal was to finish my graduation work, but it was clear on Saturday morning, that it won't come true. I did something, but we can't talk about finishing. I also write an article for school magazine, because I don't like doing things for the last minute. And today, to relax a little bit, I had beauty day (read more at the next article). I also started to exercise and eat healthier- soon on the blog next article about project Be fit with me. And now the promised tips. First thing, that I want to share with you is video from fashion & beauty blogger Dulce Candy and it's Make-Up collection. I've never seen somebody, who has so many cosmetics products so if you're interested, the video is here. And second tip is about Yankee Candle, which are quite popular nowadays. At the page yankeesvicky.cz are big sales, so hurry up to catch some amazing candle. Looks wonderful! 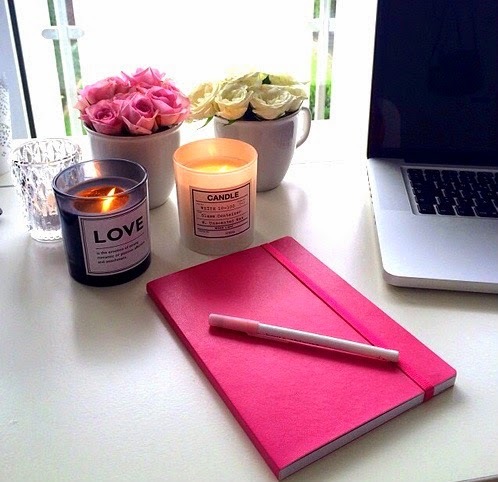 So pretty your notebook!